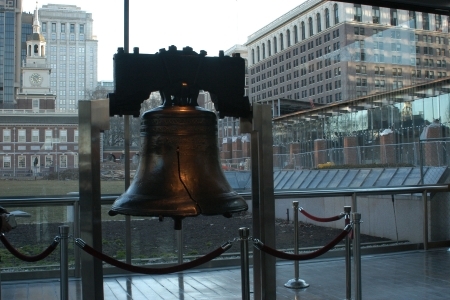 A man was detained this morning after threatening to blow up the Liberty Bell. Park rangers stopped the unidentified male and told them he wanted to blow up the landmark and his two backpacks contained explosives. Police arrived on the scene at 10:45 am and blocked off Market Street between 7th and 8th Streets. The Philadelphia Bomb Squad arrived shortly after to examine the backpacks. It was determined that the man did not have any explosives. The street was reopened at 11:45 am and the Liberty Bell Pavilion on the next block was never closed. The man who is not being identified at this time is expected to be charged. The National Park Service is handling the investigation. UPDATE: Police have identified the man as Carlos J. Balsas, 41, of Tempe, AZ. Balsas used to be a professor at Arizona State University. He initially tried to enter the Liberty Bell Pavilion but when a security officer began to search his backpack he told them there were explosives in there before grabbing his bags and leaving. He was stopped by U.S. Park Rangers nearby on Market Street. Balsas is charged with terroristic threats, bomb threats, possessing an instrument of crime, reckless endangerment, and related offenses. The Philadelphia Gun Show being held at the National Guard Armory on Roosevelt Blvd and Southampton Road in the Northeast this weekend has see a large increase in attendees over past years. Many are interested in semi-automatic type weapons that might fall under stricter control if proposed federal legislation is passed. Some aren't too concerned that the tightest restrictions will be able to get through Congress. Appalachian Promotions is putting on this show. Just this week the Eastern Sports and Outdoors Show put on by Reed Exhibitions was cancelled after it received negative reaction from the NRA, various sponsors, and gun enthusiasts by disallowing vendors from selling 'modern sports rifles'. The Philadelphia Gun Show continues on Sunday from 9 a.m. to 3 p.m. The family and friends of Melissa Ketunuti are devastated by this senseless act of violence that has ended the life of someone who was so loved, cherished and admired. Melissa was a loving daughter and friend, a dedicated physician and a talented researcher. She was known by her residency and fellowship colleagues as a positive and compassionate presence. Her passion for medicine -- international medicine, in particular -- was an inspiration to those who worked with her. Melissa's friends from childhood, college, residency and elsewhere remember her many kindnesses, even during long hours, as well as her zest for life: traveling, running and spending time with friends and family. Melissa was a source of joy to everyone in her life. Her passing has left an enormous gap in our lives, and the family requests privacy to mourn during this difficult time. 36-year-old Jason Smith of Levittown, PA has been arrested and charged with the gruesome murder of the doctor. Smith was sent out to Ketunuti's home to perform extermination work. While he was working, an argument ensued in which he struck Ketunuti before strangling her, binding her wrists and ankles, and setting her body on fire. He has confessed to the crime. Smith has not had any previous run-ins with the law, save a traffic ticket or two, but Philadelphia Police are double checking to determine if he is connected to any unsolved or open cases, particularly several rapes from Pennypack Park. Smith vaguely resembles the police sketch.